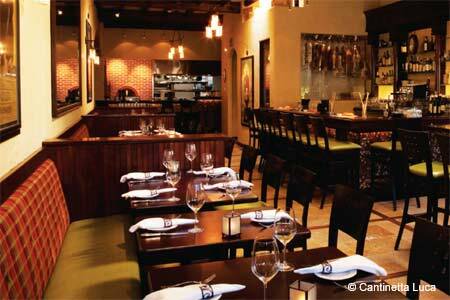 A casual yet elegant Italian restaurant with an open kitchen and an open heart. : With its strikingly modern décor and team of well-informed staffers led by general manager Giuseppe Panzuto, Cantinetta Luca offers an elevated take on rustic, bold Italian flavors. Artisan salumi --- shaved paper-thin, some studded with fennel or peppercorns --- are best paired with soft, silky burrata and crostini. Chef Jason Balestrieri’s expertise and Italian heritage shine through the rest of the menu: tender baby octopus with charred lemon with chickpeas, salami and cauliflower, tender pork meatballs, and house-made seasonal pastas that are pure comfort. The all-Italian wine list contains gems such as Falanghina and Moscato d'Asti, the latter harmonizing with a dolce of house-made banana-Nutella gelato. If in season, make a beeline for the creamy pumpkin budino.